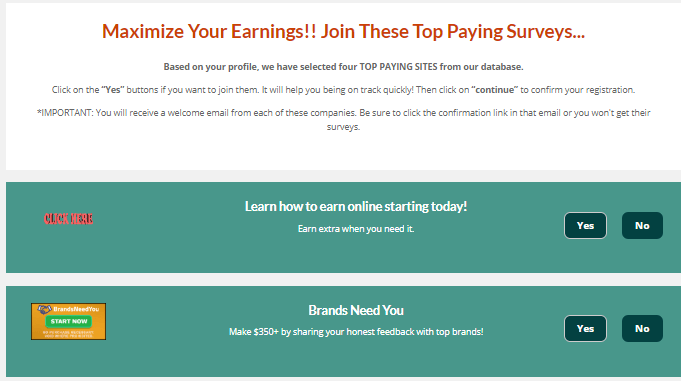 Panel PayDay claims you can earn $25-$75 per survey, if you join the site. 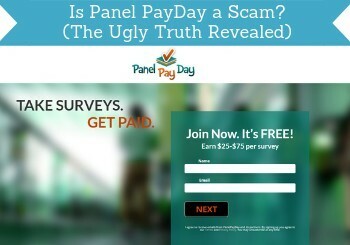 But is Panel PayDay a scam, or is it really one of the great paid survey sites? Let me reveal right away that I am NOT a fan of this panel. There are so many things you are not told, and you can in my experience end up wasting a lot of time. I have tested the site myself, and in this Panel PayDay review I will give you an inside look, so you can see for yourself what you really get, if you join, and then decide if it is worth your time or not. What is Panel PayDay and what does the site offer? At first sight Panel PayDay looks like an ordinary survey site. Except for one thing – you are told on the front page that you will earn $25-$75 per survey. I have taken thousands of online surveys myself and tested hundreds of sites. There are at times surveys that pay this much, but you will usually never see survey panel advertise it as this being normal to earn this amount per survey, as it will give people false expectations. You can earn some nice extra cash by taking paid surveys, but you will rarely see surveys that pay this much, and it is definitely not realistic with the offers Panel PayDay promote (more about this later). This made me a bit suspicious from the beginning, and I looked further into it, and it turns out the site is created by the same people that have created SaySo4Profit, which I have previously reviewed and NOT recommended. But I still decided to join Panel PayDay and see what happens. Usually sign-up processes for survey sites are fast and you get access to the platform in minutes. It is not quite as simple on Panel Pay Day. This first thing you need to beware is the conditions you agree to when signing up for the panel. Below the subscribe button it says the following in small writing. You have to agree to receive mails from their marketing partners to sign up. It says that by signing up, you will at the same time agree to receive emails from their marketing partners. It does not say who their partners are and how many. And you have to agree to this to sign up. This is a big warning sign and not something that is normal for a survey site. This means that they will be sharing your email with partners that can then start sending you promotions. The top survey sites would never request such a permission, and this made me very concerned. In the name of testing both good and poor sites for PaidFromSurveys.com, I however still signed up. The following sign-up process just confirmed my suspicion that it is not a site that will provide quality info for you, but it is a site that seems to be created just to promote whatever offers they can earn commissions promoting. Right after signing up I got to a screen with offers. You have to go through several screens of promotional offers to sign up. The above image just shows a couple of the offers that was on the list I was presented to. Many of them even had nothing to do with paid surveys. This is offers Panel PayDay gets commissions to promote, and they try to push them to you in the sign-up process itself. If it was then great offers for surveys I could maybe accept it, but it is NOT in this case. There were all kinds of offers. Some of them took me to the actual offer they advertised, but many links also took me to some kind of winner claim from that said I was guaranteed to win, as long as I would fill out my information. 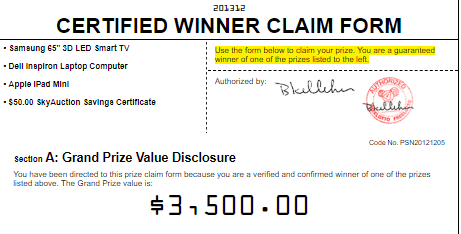 Some of the links took me to this winner claim form. I have seen links to this particular form before, and it is always a big warning sign for me to see this. I had to go through 4 screens of offers I had to say yes or no to. A sign up process that is full of promotional links, where many do not even take you to the offer promised, and where the offers seem random and are for all kinds of topics, is already a waste of time. But if you then at least get access to some great surveys once you are inside it could maybe be accepted – this is however not the case, as I will show you now. Once you join Panel PayDay, you get to see a list of all the surveys they offer. That is what they call it anyway – in reality it is a list of all kinds of offers. But I must also say that there are actually also some great survey sites on the list. Some of the survey sites promoted are good sites. 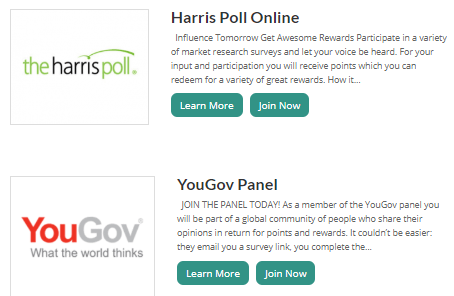 On the above image you can see that YouGov for example was on the list I got, and this is definitely a legit site, and there were several other great sites on the list. However, not all the links took me to the actual survey sites, but several links took me to the same winner claim from I showed previously in this review – very annoying. In addition to this, not all the offers are great and there are several that has nothing to do with paid surveys. You also do not find any real info about what the different offers are about. You just get a list and some superficial info about the sites and then a link, so you can join and Panel PayDay can earn commissions. I do not mind websites earning from promoting offers – I do this myself, as it is otherwise not possible to run and develop a website and spend all the time it takes to do this. My issue with Panel PayDay is that the info they give is very poor and superficial and that the list of offers in my opinion is not based on quality but just on promoting, which the whole sign-up process proves. If you are new to paid surveys, you have no way to know which offers are the good and which ones are not. And the claims the site in general makes gives people false expectations in my opinion. You can also get access to Panel PayDay’s community page on the website. It is however just a link to a Facebook page which is run in the name of SaySo4Profit. Panel PayDay says their community page is to discuss and give tips – this is NOT my experience. They make it sound like it is a place where you can discuss paid surveys and get great tips and tricks. I have been a member for a while, and this is NOT what it really is. In my opinion it has nothing to do with a community. It is just a place where the owners post offers that are a bit cryptic to create some hype and get people to contact them and then send them links, so they can earn commissions. An example of a typical post in the Facebook group. The above example is a typical type of post you can find in this Facebook group. It makes some kind of claim that makes it seem very easy to make money online, and then encourage people to contact them for more info. I am mostly surprised how many people are members of this group and seem to be interested when they make these claims, and how not figures out what the page really is about. There is no discussion, and if you are not one of the owners, your posts will not be allowed – I know this, because I have tried to post in the group myself. And no discussions are encouraged. The only thing they are interested in hearing is, if you want them to send you a promotional link. So overall a very poor “community” page that is just another way to promote their offers, where you never really know what the quality of them are, as commissions and not quality seem to be what drives Panel PayDay (in my opinion anyways). Panel PayDay has one more trick up the sleeves to try to get commissions by promoting to you. If you try to leave the sign-up form page, a pop-up will sometimes come up and ask you, if you are sure you want to leave. If you say you want to stay, you are redirected to a site with “special” offers. I got some “special” offers, when I tried to leave the website. Above you can see the offers I got. I have previously made reviews of two of the sites that are promoted here. That is iSurveyWorld, and I have also previously reviewed the site SurveyMonster. Both of these sites are very promotional and do not offer any value in my opinion. But they pay people commissions to promote them, so that is probably why you are taken to this special offer, when you are about to leave, and are told you can start making money right away. After seeing this, I lost the last tiny bit of respect I had for Panel PayDay, but with promotions of such offers and promoting it is as an easy way to earn, I can in no way support the approach of this site. As you can see, I am not impressed with what Panel PayDay has to offer. Another reason for this is that you actually do not get paid by the site itself. It might look like this would be possible before you join, but this is not the case. Panel PayDay is just promoting links to other sites. You have to go and join these actual sites yourself, and if you are lucky to find the good offers they promote, you will then get to some good survey sites, where you can earn. But Panel PayDay itself does not pay you, and you can not earn actual money on the site. I think it is great to be able to take surveys on mobile devices, as it is very convenient, and if you have read any of my survey reviews before, you will know I therefore always include a section that explains the mobile opportunities on the survey sites I review. In theory you can use Panel PayDay on mobile. The website is optimized for mobile use. However, as already explained the opportunities there are limited, and you will not earn any money on the site itself, so it does not really matter, if it is optimized for mobile or not. If you like taking surveys on mobile, you can for example instead check out some of the top survey sites with apps that give you actually ways to earn on the sites. Who can join Panel PayDay? If you are still interested in joining Panel PayDay, it is in theory possible to do no matter where you live. Most of the offers they promote are for the US, but there are also some for other countries, and there are no restrictions on the countries that can join. But in case you want to check it out without having to give them and their partners permission to send emails to you, I have actually found out the is possible without joining. If you delete the last part of it, where it says “landing” and click enter, you will actually get access to the front page of the website. The thing is that even here it might look like you will get access to more, if you go through the joining process. But you will not. By signing up you are just taking through a lot of offers only to be directed to the same front page you have access to without signing up. This clearly shows that the whole sign up process is just a way to get your contact info and get your permissions to send you promotions from both them and their partners. It is clear that I do not think this site is worth the time, but is Panel PayDay legit or a scam? Let’s sum up the pros and cons of the site, and then you can judge for yourself. In my opinion Panel PayDay has an overwhelming amount of disadvantages. I am not a lawyer, so I cannot say for sure, but from a legal perspective I am however pretty sure it is not a scam, since you do get access to some legit offers. I however think the site is a complete waste of time, as you find no valuable information that can help you find the best survey sites for you, you never really know ,if it is a good or poor offer they promote, and in my opinion it is clearly a site that is more focused on promotion than on helping you find the best opportunities. There are so many better survey sites with actual earning opportunities. You can for example check out the list of the best sites in your country here. With so many sites where you can actually earn directly on them, I see no reason to waste time on Panel PayDay. If you have any comments, questions, or have any experiences with Panel PayDay yourself, I would love to hear from you in a comment below. The terms of joining Panel PayDay opens you up to a lot of promotions, the site does not have in-depth or helpful information, and many of the offers promoted are a waste of time. You will in addition to this not be able to earn on the site itself, but just get a lot of promotional links. Definitely not worth the time in my opinion.